A gold edge mahogany frame, red suede and gold mat, embossed McGill logo and 24K gold plated medallion. A gold edge mahogany frame, red suede and gold mat, embossed McGill logo and 24K gold plated medallion. Measures 19 by 23 inches and holds an 11 by 17-inch horizontal diploma. Cherry frame, red suede and gold mat, embossed McGill Logo. Measures 19 by 23 inches and holds 11 by 17-inch horizontal diploma. Cherry frame, red suede and gold mat, embossed McGill logo and 24K gold plated medallion. Cherry frame, red suede and gold mat, embossed McGill logo and 24K gold plated medallion. Measures 19 1/2 by 23 1/2 inches and holds 11 by 17-inch horizontal diploma. Finely crafted mahogany wood frame with red suede, gold mat, and embossed McGill Logo. Finely crafted mahogany wood frame with red suede, gold mat, and embossed McGill Logo. Measures 19 by 23 inches and holds 11 by 17-inch horizontal diploma. Finely crafted wooden frame treated with deep mahogany-coloured stain and aged at edges. Protected with semi-gloss varnish. Finely crafted wooden frame with multi-step beveled edging. Treated with deep burgundy stain and aged for an authentic look. Finely crafted wooden frame with multi-step beveled edging. Treated with deep burgundy stain and aged for an authentic look. Red acid-free paper mat features gold foil-stamped McGill wordmark with crest and painted gold fillet trim. Easy mounting and installation. Measures 19 1/2 by 23 1/2 inches and holds an 11 by 17-inch horizontal diploma. Gold edge glossy mahogany frame, red suede mat, gold filet, embossed McGill logo and 24 karat gold-plated medallion. Dimensions (W×H): 19" × 23"
Cherry frame, red suede mat, gold filet, with embossed McGill logo. 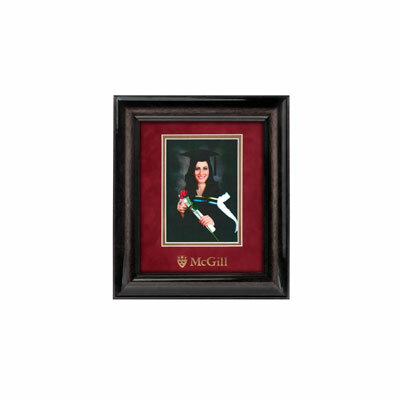 This dark chocolate coloured frame has a glossy varnish finish, a red and gold mat with McGill logo. This dark chocolate coloured frame has a glossy varnish finish, a red and gold mat with McGill logo. Frame measures 20 X 16 and holds 11 X 17-inch horizontal diploma. All Milburn frames are made of solid wood which is harvested from government-controlled tree farms. For every tree that is cut down, 2 seedlings are planted. All Milburn frames are proudly made in Canada. All Milburn mats are cut from Crescent brand WHITE CORE ECO matboard. The wood pulp has been treated to remove all impurities. The bevel will always remain a crisp white and will not tarnish, bleed or discolour. The matboard is made from 95% recycled components. The Luxuria picture frame is perfect for your graduation portrait. The Luxuria picture frame is perfect for your graduation portrait. 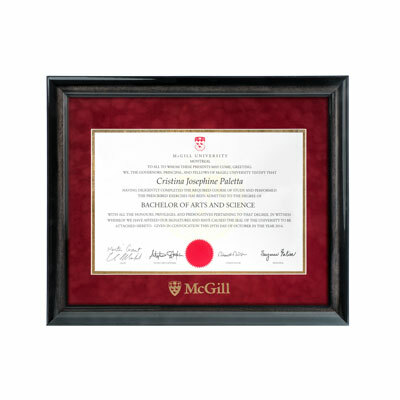 This dark chocolate coloured frame has a glossy varnish finish, a red and gold mat with McGill logo. The frame measures 11 X 14 and holds a 5 X 7 vertical photo. This product is only available for in-store pick up. This profile has an edge to its design. It is a “must have” for those who prefer black accents and highlights in their home or office. This profile has an edge to its design. It is a “must have” for those who prefer black accents and highlights in their home or office. The Infused Black moulding is made in Italy and has a rich, semi-gloss finish. Measures 19 by 23 inches and holds 11 by 17-inch horizontal diploma.